Charles-Cook linked with Premier League move. 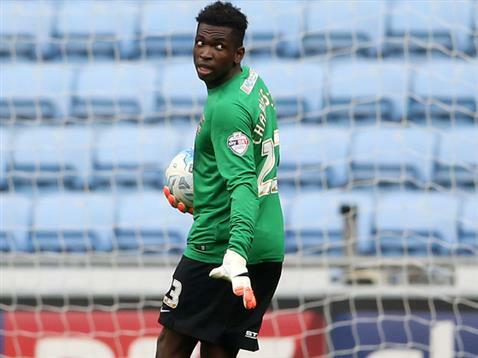 Last night Coventry City goalkeeper Reice Charles-Cook kept his fifth consecutive clean sheet and today he’s been linked with a move to two Premier League clubs. After last night’s 0-0 draw at Rochdale, most of the media speculation has been surrounding the debut of former England international Joe Cole, Charles-Cook has quietly gone about writing his own name into the Sky Blues’ history books. The 21 year old, is the first ever Coventry City goalkeeper to keep a clean sheet in each of his first league starts for the Club, and last night was his fifth consecutive after the 0-0 JPT draw at Yeovil Town. After being handed his first league start following an illness to Lee Burge, Charles-Cook has quickly become a fan’s favourite with some impressive displays between the sticks. Now, Midlands rivals Aston Villa and Stoke City are reportedly scouting the former Arsenal academy starlet who is out of contract with the Sky Blues at the end of the current season. « Mowbray masterminds Cole coup.